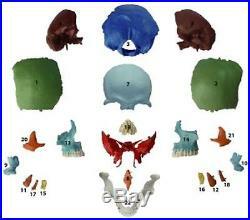 Complete disarticulated adult skull in 22 parts (didactic colored) This is the world most scientific 22 parts bone model with the best skull bone details. It includes 22 individual bones in 9 different colors. 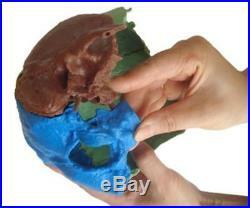 Cast from real adult specimen this skull depicts detailed structures not seen in any other product before. Every bone is superb scientific. 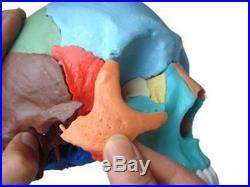 Great attention was put on all details, especially the sphenoid bone. The temporal bone even shows the carotid artery canal. 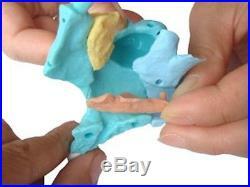 It is best for teaching and learning, a perfect tool for osteopaths. Assembly and connection: with magnets and connectors for easy assembly and best connection. Special plastic connectors are used to secure firm and stable assembling, while magnets help you rotate the separate bones in the right directions, before connecting. 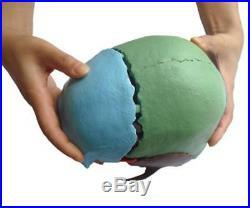 Compared to magnets-only skulls this product is much more stable and will last for many years. Magnetic forces tends to weaken over time. 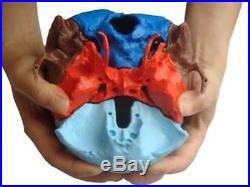 Material: hard durable plastic The skull comprises following individual bones: 1 Parietal bone, right 2 Parietal bone, left 3 Occipital bone 4 Temporal bone, right 5 Temporal bone, left 6 Sphenoid bone 7 Frontal bone 8 Vomer bone 9 Palatine bone, right 10 Palatine bone, left 11 Inferior nasal concha, right 12 Inferior nasal concha, left 13 Upper jaw (maxilla) with teeth, right 14 Upper jaw (maxilla) with teeth, left 15 Lacrimal bone, right 16 Lacrimal bone, left 17 Nasal bone, right 18 Nasal bone, left 19 Ethmoid bone 20 Zygomatic bone, right 21 Zygomatic bone, left 22 Lower jaw (mandible) with teeth Includes Colored User Guide in English, French, German, Spanish, Italian, Latin and Japanese. 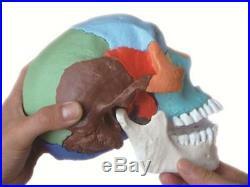 FAQs Q: Whats the size of this skull model? 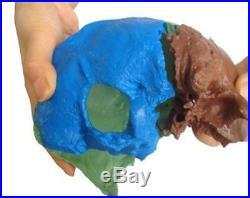 A: This skull model was cast from real adult specimen. It is adult life size and highly anatomical accurate. Q: Whats the difference of this model compared to other models with only plug connectors? 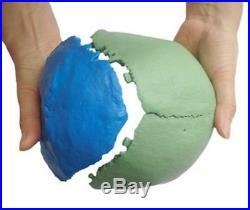 A: It contains magnets, which makes assembly easy, rapid, simple and right to the place. Q: Whats the difference of this model compared to other models with only magnets? A: - It contains sturdy plug connectors which hold the bones together firmly, as magnets become weaker over the time. It is highly stable even beyond years. Q: How long will this product be stable? A: Magnets get weaker over the time. Only plug connectors guarantee a long stability in the product. The product can remain as good as the first day even after many years. Q: Whats included in this skull kit? A: It include: - 22-part Skull model, assembled - Colored user guide in German, English, French, Italian, Spanish, Latin and Japanese - 9 extra replacement bones Q: Can I order single bones separately? A: When desired individual bones can be ordered separately. These bones come without plug connectors or magnets. Address us please, which bones you need. 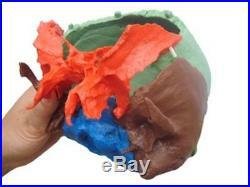 The item "Human Medical Anatomical Adult Osteopathic Skull Model, 22-Part Didactic Colored" is in sale since Friday, November 09, 2012. This item is in the category "Business & Industrial\Healthcare, Lab & Life Science\Medical Supplies & Disposables\Teaching & Education Supplies". 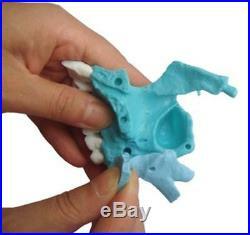 The seller is "welldenanatomy" and is located in Toronto, ON. This item can be shipped to Canada, to United States.